Acetate utilization test is employed in the qualitative procedures to differentiate species of Shigella from Escherichia coli and non-fermentative gram negative bacteria. To differentiate organisms based on ability to use acetate as the sole source of carbon. Generally used to differentiate Shigella spp. from Escherichia coli. This test is used to differentiate an organism capable of using acetate as the sole source of carbon. Organisms capable of using sodium acetate grow on the medium, resulting in an alkaline pH, turning the indicator from green to blue. Organic acids have been used widely as an aid in the differentiation of Enterobacteriaceae, usually in formulae that contained organic nitrogen sources. Most bacteria, however, can use citrate and acetate in the presence of organic nitrogen. The differentiation of groups is based on the ability or failure of the test culture to utilize acetate in a medium devoid of trace organic nitrogen but sodium acetate as the sole source of carbon. Most Shigella and Proteus species are unable to utilize acetate and therefore fail to grow. Majority of Escherichia coli and closely related organisms grow well within 24-48. Acetate utilization is indicated by formation of blue colour, which is due to the utilization of sodium acetate and subsequent formation of an alkaline reaction detected by the presence of bromothymol blue indicator. NaC2H3O2 (2 g); MgSO4 (0.1 g); NaCl (5 g); NH4H2PO4 (1 g); agar (20 g); bromthymol blue indicator (0.8 g), per 1000 mL, pH 6.7. Emulsify a portion of the colony from a pure, 18-24 hour culture in 1.0ml of sterile physiological saline (0.85%). With a straight inoculating needle, inoculate acetate slant lightly from an 18- to 24-hour culture. Do not inoculate from a broth culture but rather from a plate. Positive: Medium becomes alkalinized (blue) as a result of the growth and use of acetate. Negative: No growth or growth with no indicator change to blue. 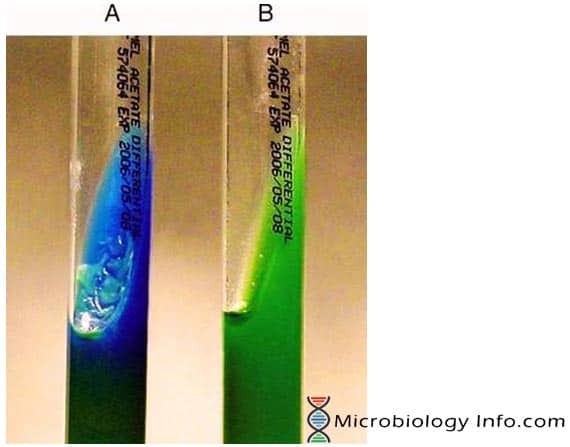 Some strains of E. coli may use acetate at a very slow rate or not at all, resulting in a false negative reaction in the identification process. Certain strains of Shigella flexneri are capable of utilizing acetate. 7.7% of Shigella flexneri 4a, mannitol +, and 86% of Shigella flexneri 4a, mannitol -, are acetate-positive. Heavy inoculums may result in a false positive result.